•CNC Rotary table change providing work piece loading & unloading when processing. Saving time on the work piece load waiting. 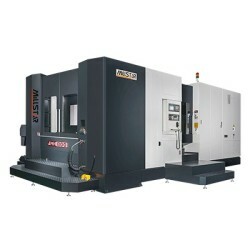 •CNC Rotary table use serve motor driving, position accuracy exactly. •Scissors type of telescopic cover can reduce motor output, noise, increase movement smooth and force average. •Extra chip flushing system with 30 spouts providing 3 flushing areas need. Chip flushing system is effective increase 33% up flushing.